Offshore Software Solutions is a trusted name in software and web development industry. Our passionate and qualified developers always put their best efforts into finding new ways to work. 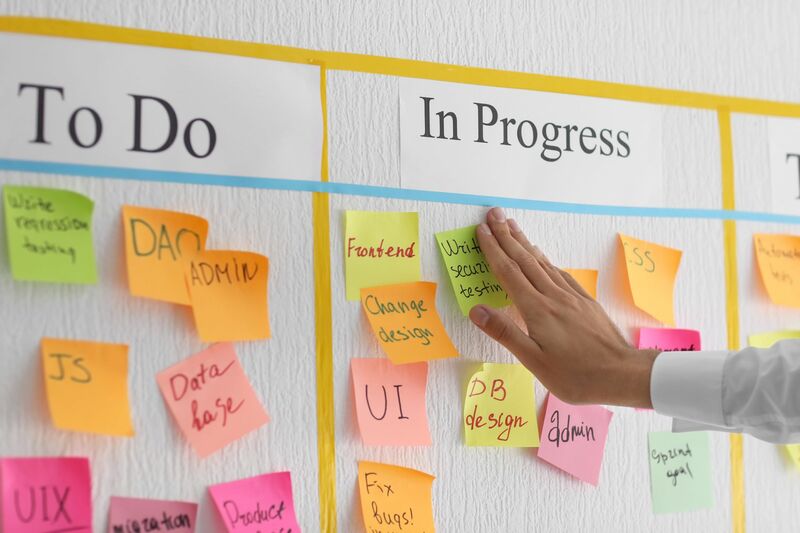 One of the best approaches that our development team takesto develop and maintain software and websites is an Agile Methodology. It helps us in completing our projects on time and within budgetby implementing our strategy in a proper way. Agile Approach has revolutionized software & web development because it is a very effective method for Project management. It helps our developers and the clients to eliminate any sort of unpredictability during software development. It uses a number of work sequences such as iterative and incremental; which are known as Sprints. Did You Know What Sprints Are? Read It! Before we go into the whole detail of our Agile Methodology, let us tell you what sprints are. A sprint is a time period allocated for a specific phase in development, most of time 2 or 3 weeks. A sprint exists out of User stories and tasks with a certain purpose. And the task is normally completed in the specific time period. Collaboration: Our developers and the clients always keep in touch during the whole project. They collaborate together by sharing requirements, strategy, development work,and testing so that a successful software product can be produced in a short timeframe. Short Iteration (The sprint): Our development team works in sprints with regular and predictable deliveries. In each sprint, they review and demo the product with the client and make modifications on time. In this way, they ensure the product’s delivery in the shortest amount of time. User-Centered: Our development process is user-centered. It means that software products are produced in order to meet the clients’ requirements. We also consider our client’s preferences first when our team updates their products regularly. Transparency: We maintain a transparent and friendly working environment, as well as, simplifying the tasks among the team members to increase efficiency. On the other hand, we work closely with our clients so they always have information about their project’s working. Every client has different demands in term of software development and management project. Some put more emphasis on their organization and employees whereas for some clients; the main focus is the external things such as their customers. So, at Offshore Software Solutions, we use two different Agile methods to fulfill all the particular need of our valued clienteles. Our agile methodology consists of two main methods that are Scrum and Kanban. It is an iterative approach that a lot of companies take. The main focus of this approach is clearly defining the entire requirements before the start of a sprint to ensure its efficiency. The prior requirements include selecting the main features and clarifying the objective of the task. It designs for gathering data with minimum to no error. For Whom Is Scrum Best Suited For? The best way to practice Scrum is by having strong communication, adaptability, determine acceptance criteria, having the whole team of developer’s approval for the source code. It is the second most effective method in our agile methodology. In easy words, it is a long list of things that need to be done. It is not time-based like scrum. It is done at the time of development of testing. The thing done is marked complete in the list. In this way, it helps us to keep track of all the tasks. The tasks done in this approach is purely based on priorities. Our developers select the task from the to-do list and start working on that specific task. It gives plenty of flexibility to the developer’s group. For instance, all the tasks are present in the list. Now the developers can pick their desired task (based on their area of interest) from the list and start working on it immediately. It provides transitions to business analysts, testers, developers, and etc. They need to have active communication. This is the quickest way to develop a software program because every person in the developer team can lend a hand. For Whom Is Kanban Best Suited For? How Do We Work Using Agile Approach? At Offshore Software Solutions, our competent development team works by following the agile approach. We divide a project into different phases/sprints and we work accordingly. We don’t move to the next sprint until the first sprint is completed. Testing and modifications are made in every sprint in order to make a product error-free. By following all sprint one by one, we make sure each project is completed on time and within the decided budget. Product Quality:It increases product quality. Regular testing of the code and working emits all sorts of errors from the program. Short Sprints: Since the whole project is divided into short sprints, we handle the project with full control and make updates at the end of every sprint. Every team member has full control over his task so the end product is free of inaccuracies. Reduce Risks: It reduces the risk of complete project failure. Our team actively checks the product functioning from the very first sprint. Fast Delivery: With the Agile approach, development is started earlier. The product is released fast after little iteration. Full Control on Budget: Our agile methodology also minimizes the cost of the project. We implement the agile development strategy and have a full control on a budget. If you are ready to build a software program for your organization, don’t go anywhere else. We are here to help you in this regard. Call us right now and discuss your project with us, Offshore Software Solutions agile experts will provide the best solutions according to your desires and requirements.